This delicious Chocolate Almond Raspberry Coffee Cake is moist, buttery, nutty and is great for all occasions. It is simple and easy to make and tastes amazing! 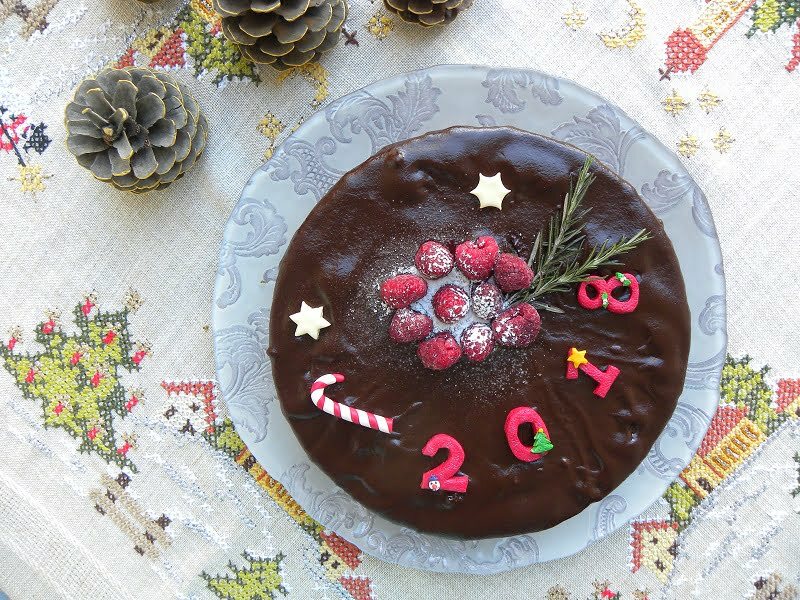 This is my first post for 2018 and as always, I want to start with a sweet recipe with the wish that at the end of the year, you year will be filled with sweet memories. Wishing you and yours A Happy New Year with the hope that you will have many blessings in the year to come. I turned this coffee cake into a Vassilopita. It is not the traditional one but then there are so many variations, why not make another one? Vassilopita tradition is to place a coin in the cake as a token of luck to the person who finds it in their piece. When the year changes, the Vassilopita is cut by the head of the house. Read more about the traditional cake. This cake was made with roasted blanched almonds, flavoured with rasperry essence and with finely chopped white chocolate inside. I also added some prickly pear liqueur, made with pomace, which my son brought from Amorgos island, but you can add any liqueur you like. If you are wondering what kind of liqueur to use in order to substitute the one I used, I would suggest any citrus based liqueur, (Lemon (limoncello), Mandarin, Orange, Bergamot), or Cinnamon, Chocolate or Ginger. The white chocolate is not visible inside because it melts during baking, but it adds lots of flavour and it also makes the cake super moist. I added a chocolate ganache on top, which had two kinds of chocolates in it, one was couverture chocoate and the other milk chocolate. I also added a few drops of raspberry essence in it as well as some of my gourmet peppermint salt and finely grated black pepper. The addition of coarse sea salt and pepper makes the chocolate glaze divine and brings it up to a new level. However, if you don’t have an aromatic sea salt, you can just add any coarse sea salt you like. The ganache is optional for this cake because the cake can stand alone without it but I highly recommend it. We love chocolate and it pairs well with raspberries. I made more ganache than I needed because I wanted to use the leftover ganache to make a Black lava Orange Gateau with leftover kourabiedes, melomakarona and gingerbread cookies, so just make half the dose. I must say this was the best coffee cake I ever eaten and it dissappeared in no time. Try it. You will not be disappointed! Preheat the oven to 180o C / 350o F.
While the oven is preheating toast the almonds until lightly brown. Remove from the oven and set aside to cool. Mix the dry ingredients (flour, corn flour, sea salt, baking soda and lemon zest). Pulverize the almonds in a food processor, adding some of the dry ingredients. Wash a coin, wipe it and wrap it in aluminium foil. Line a 25.5 cm (10 inch) cake pan with parchment paper and grease the paper and the sides of the pan with some butter. Using a hand mixer, whisk the egg whites with lemon juice until the egg whites become stiff. Using a stand mixer, on high speed, beat butter and sugar until light and fluffy, for about ten minutes. Add the egg yolks and mix to combine. Pour in the liqueur and raspberry essence and continue mixing. Occasionally, scrape the sides of your mixing bowl, using a rubber spatula. Finaly, add the almonds and chocolate and mix. Turn off the mixer and using a spatula, gently gradually fold in the meringue, alternating with some of the flour mixture, until all is incorporated. Empty half the batter into the cake pan and put the coin in. Add the remaining batter on top. Tap the pan on the counter so that the batter is evenly distributed and break any air bubbles. Bake in the middle level of the oven for about 1 hour or until a knife inserted in the centre comes out clean. Remove pan to a rack and let it cool. Run a knife around the edges of the pan, and reverse cake to remove the parchment paper. Turn it back on the other side as the coin will be on the bottom of the cake. In a double boiler melt the chocolate. Add the ganache on top, helping it drip to the sides. Decorate with raspberries and some icing sugar sprinkled on top. *In case you are wondering what kind of liqueur to use in order to substitute the one I used, I would suggest any citrus based liqueur (Lemon (limoncello), Orange, Mandarin, Bergamot), or Cinnamon, Chocolate or Ginger.